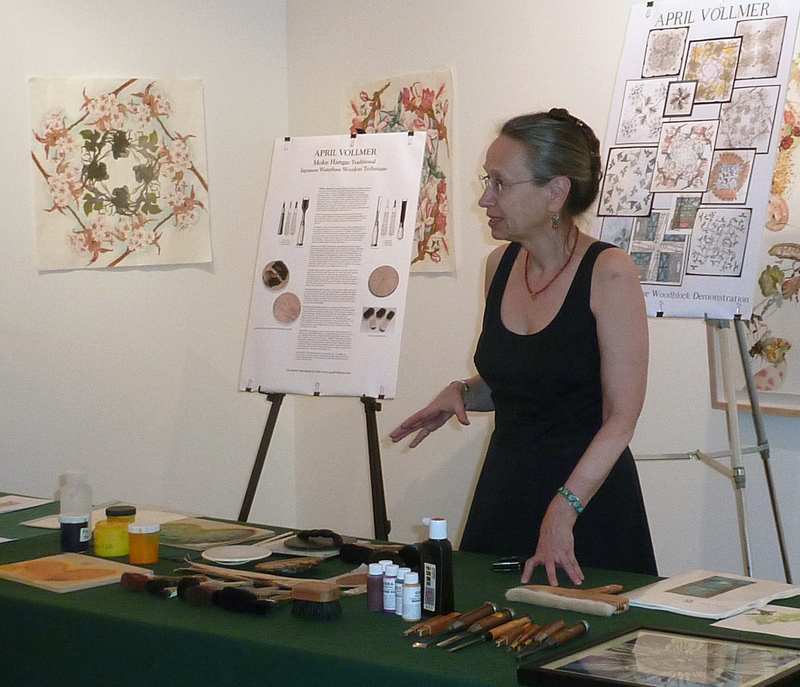 Lectures: April Vollmer’s slide lectures expand on material presented in her book Japanese Woodblock Print Workshop. They include an historical overview of Japanese woodblock and discuss the evolution of the materials and techniques in a contemporary context. The lecture includes photographs from research in Japan and is richly illustrated with artwork by international artists. Demonstrations: These two and three hour lecture-demonstrations include a printing demonstration and a look at a portfolio of actual prints along with the slide introduction to the traditional Japanese technique of mokuhanga. The lecture includes a historical overview and a discussion of Japanese paper, tools and techniques. Time permitting, participants can experience mokuhanga more directly by printing with a baren themselves. These workshops allow more time to look at prints and to discuss the differences between eastern and western approaches to woodblock. The first half of class is devoted to cutting a multi-color block, and the second to printing. Each student designs, cuts and prints a small woodcut edition. Week long workshops focus the production of an edition of multi-colored prints, and include a more thorough discussion of the history of woodblock printing. Each morning and afternoon session begins with a discussion of a different aspect of mokuhanga: kento registration, Japanese tools, sharpening tools, the baren, Japanese paper, etc. Printmaking experience is helpful but not necessary. Because each situation is unique, fees vary. Please call or email to discuss. Students should expect to pay $50 to $100 for supplies depending on the length of the class. The host institution is expected to cover the cost of housing and transportation.